Erdbeerkuchen! Strawberry cake! My dessert of choice for our Fathers' Day dinner. I wanted something special, yet light and fresh, so decided on this erdbeerkuchen. What it is, is a simple sponge cake, topped with strawberries and a glaze. Very simple, very summery, absolutely heavenly. I didn't, however, have my own recipe. Even my encyclopaedic Culinaria Germany book lists "pre-prepared base" as an ingredient. As if! And seeing as it was the mittel of the nacht in Germany, I couldn't very well hassle my friends over there with texts and emails. I had to channel my inner MacGyver, and come up with a recipe myself. I chose to use a Victoria Sponge as the base. Nigella's Victoria Sponge is the easiest to make - bung everything in the processor and whizz until smooth. No sifting the flour 3 times, no creaming, no beating. 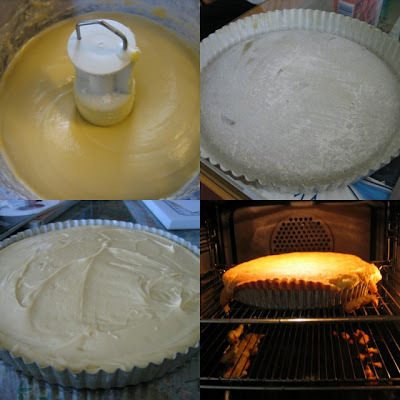 I have a battered old 25-cm flan tin from many years ago, which I buttered and floured carefully, so that my finished erdbeerkuchen base would keep its shape. As per the recipe in How to Eat, I made a 4-egg Victoria sponge mixture, which filled the tin. What I didn't realise was that the mixture would rise dramatically upon baking. It overflowed from the tin and dripped down the sides onto the racks and floor of the oven. WHOOPS. Next time, I'll scale down the quantities to 3-eggs. The Culinaria Germany recipe instructs you to hull the strawberries, and macerate them in sugar and vanilla for a short while. I halved the berries, and let them sit, growing ever more red and juicy, while the cake was cooling. Once the cake was cool enough, it was a simple matter of arranging the strawberries on the cake! I didn't know how to make a cake glaze, so I brushed the strawberries with warmed strawberry jam. We had it as dessert with lashings of freshly whipped cream. I'm sorry for tooting my own horn, but this was incredible! Who knew that this cake would be so easy to make? I'll definitely be pulling this one out over summer, for BBQs or outdoor parties. It's totally fabulous. It was best eaten straight away, when we could appreciate the fresh, fragrant berries against the soft sponge, but was still good for breakfasts the next couple of days. Sarah, that looks sooooo good! Sarah, you're so funny (inner MacGyver). This kuchen looks utterly delicious, yummy. When I saw it in your previous post I thought it was a store-bought one. I'll give it a try and let you know! I'm absolutely going to try this when strawberries are in season. Yay for Nigella's sponge...even under MacGuyver-like circumstances. Sandralein - Danke schoen! Hat deine mutter meinen erdbeerkuchen gesehen? Du hast ein Erdbeerkuchen gemacht? You didn't tell me! Was it sehr lecker? Did you machen the base or kaufen it? Laura - Yay, try it! You'll love it. I was browsing all over the web the other day for strawberry recipes as I have over two kilos of it to find a use for. If only I saw your post earlier before I ended up eating them all since I couldn't find a good strawberry cake recipe. Aye, no matter, next time I'm making this. 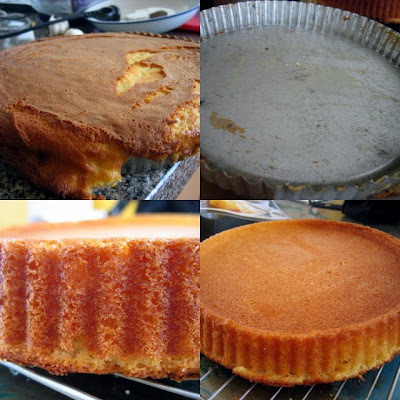 I was also wondering which sponge type cakes was a good one as I have made three failed sponge cakes recently. But seeing as I've just bought Nigella's book and now you say this Victoria sponge is so easy to make, I now have a sponge cake recipe for all occasions. 2 kilos of strawberries!!! I'm so jealous. :) I'm so psyched that Summer's around the corner! Nigella's Victoria sponge recipe is very good and easy too! I think that a Vic sponge is a bit different from what we in Australia would think of as a sponge. I've just been flicking through my Donna Hay Modern Classics II - and her recipe for "sponge cake" involves whipping 6 eggs with sugar until super-light and fluffy, then folding in flour and melted butter. Quite different from Nigella's one, which involves creaming butter and sugar, then adding the other ingredients. (Or just all in the processor). It's the same as a Victoria sponge mixture with heaps of fruit piled on top and then baked. It's AWESOME! I just bought Donna Hay's Modern Classic 2 and saw her beautiful fluffy tall sponge. But the previous three attempts I had at making sponge cakes were much light the Donna Hay one, with egg whites whipped to fluffy. I must have always folded the mixture too hard since it always turned out ultra dense instead of fluffy. I'm going to try Nigella's Vic Sponge first, and if that works, I'll just stick with that. And when peaches come into season, I'm going to try that Nigel Slater recipe you suggested. Nigella's Victoria Sponge recipe is in her books How to Eat and How to be a Domestic Goddess. Thank you, Sarah. Found the recipe!